Best Fruit On The Planet? Mangos! Ever since our Honeymoon to Brazil, my wife and I have developed an intense love for mangos — we’d eat them every morning. In the summertime, we try to eat them daily but they are hard to find at times and the prices are all over the board. However, last week I found out that our local Costco carries them in nine packs so I went bonkers and stocked up (total of 27 mangos). We’ve been eating mangos everyday for weeks! The tool that makes eating them quick and easy (’cause we all know it’s a pain to cut mangos) is made by OXO. Their Mango Splitter is one of the best kitchen tools I have ever used and a must for mango eaters. 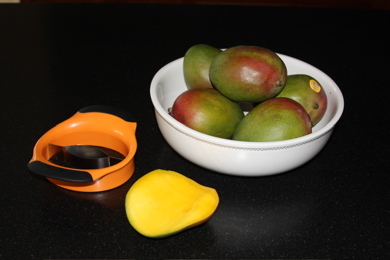 At $12 it’s a no brainer… get your very own OXO Mango Splitter from Amazon.com now and stock up on mangos from Costco!